The Continuous Improvement Program Managers have run a lot of high impact projects. We either need more CI managers or we need to increase skill and capability of line management. We seem to have plateaued in our lean journey. Passion and energy seem to have dimmed. Top management has committed to lean. The budget is in place. Training is effective. There is a core of strong experts to lead the organization. The roadmap has been written. However, day-to-day operations remain as they have been – firefighting, too many meetings, too busy to work on being too busy. Lean is centered on operations – manufacturing or service providers. Lean is extra work or projects. If any of these statements sound familiar, take some time to go observe what middle management in your part of the business is doing. I define middle management as line managers and their next level managers. They are typically 1-2 levels removed from the top managers in the organization. The habitual behaviors and actions of middle management define the day-to-day real world culture and process in any organization – sales, marketing, product development, planning, and operations. When you observe what middle managers are doing, I believe that you will find the key to the next level of the lean journey. If you want lean to be engrained the culture, then it is necessary to develop new habits, routines and behaviors for middle management. The tools used by other companies may spark some thinking. However, the fundamentals of the lean work routine need to be done locally with the full participation of the managers making the change. You want to understand current state. What do they really do? What is working? Where do they spend their time? What results do they get? Daily integrated meetings. The meetings are short and focused on alignment, engagement, and improvement. Support needs are surfaced. Focus topic meetings such as safety, quality, customer service or improvement reviews may be conducted weekly. Structured improvement processes. Every person has the responsibility to identify and implement improvements. The improvement is focused towards a challenge for the team that is consistent with the organization’s strategic vision. There is a systematic approach to direct observation, process improvement opportunity identification, and experimentation. The system is simple enough to be broadly relevant while having resources skilled in more complex tools suitable for more complex issues. The most basic step is to provide the skill and time for people to contribute. Communication skills. Middle management needs to engage both upper management and the team effectively. This includes defined, planned listening, dialogue, and experiences that make change relevant. Leader standard work. Essential tasks and roles are defined and planned into a schedule. Routine actions are divided into daily, weekly, and monthly frequencies. Activities that support the following broad categories of behaviors may be identified and included. To be clear, tasks on standard work will need to be granular and specific. Evaluation and assessment. Managers need to know how they are doing. A mechanism is needed to evaluate their progress in both the attainment of output goals (what) and the practice of new continuous improvement leadership behaviors (how). Accountability cannot be established without this. Acknowledgement and support of leadership. 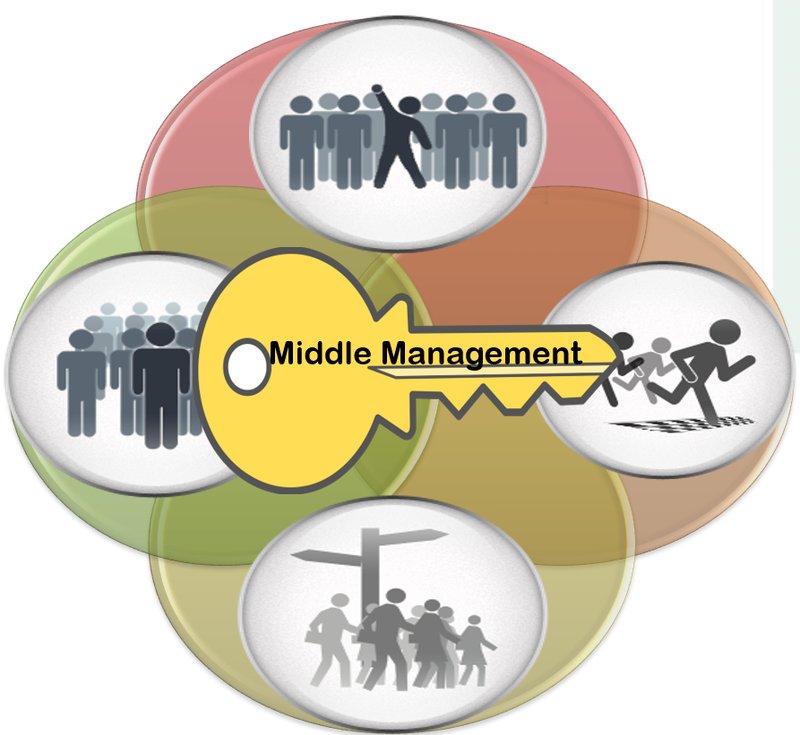 The next level leaders and managers need to recognize and reward the practice of middle management standards. Difficulties need to be problem solved and coached. As the team defines the new standard work for middle management you will need to solve how time is made for the new work habits. It is not unusual to find as much as 60% of scheduled hours consumed with mandatory meetings and tasks. Once an initial plan is made, it is important to have scheduled individual reviews as well as team After Action Reviews to improve the effectiveness of the management system that supports day-to-day improvement.